WASHINGTON (May 22, 2015) -- When Global Positioning System satellites can't be seen due to dense jungle canopy, or they are blocked due to enemy interference, Soldiers will still be able to track their location digitally using the Warfighter Integrated Navigation System. During the DOD Lab Day, May 14 at the Pentagon, Osie A. David, a researcher with Communications Electronics Research Development and Engineering Command, explained how the technology behind WINS, still under development at CERDEC labs, will one day be transitioned to an Army program manager to bring assured navigational capability to Soldiers. The Warfighter Integrated Navigation System, center, uses inertial systems to determine a Soldier's location in the absence of a GPS signal. On the left, a smaller version of WINS. On the right, the Defense Advanced GPS Receiver, which Soldiers use now for position, navigation, and timing. 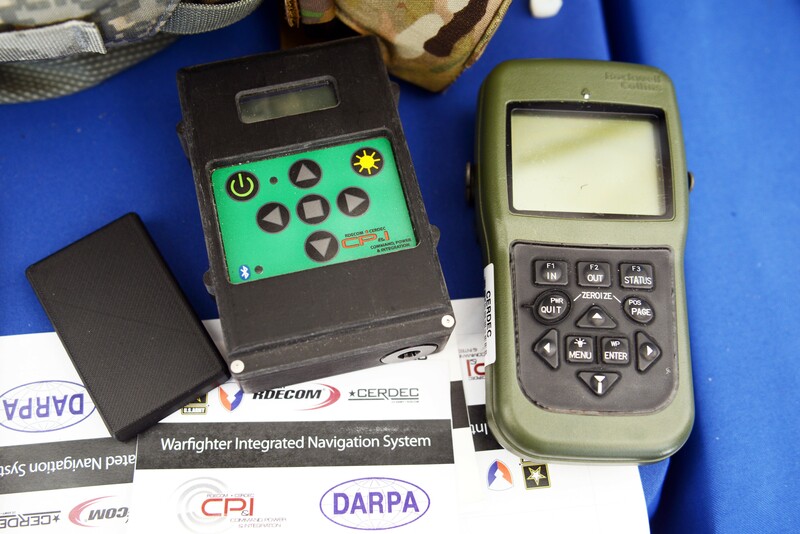 All three devices were on display at the DOD Lab Day, May 14, at the Pentagon. The WINS is a device small enough to carry in a Soldier's cargo pocket -- David actually had a larger version of the system and a much smaller version as well -- about half the size of a pack of cigarettes. "It's got a number of inertial sensors, such as a pedometer and an accelerometer, things you will find on your cell phone but of a higher quality," he said. "Even if the enemy is denying you GPS or the terrain is, you can still get known location on here so it will show up on your Nett Warrior device or your command and control system." Those inertial sensors will calculate an offset from the last-known location using footsteps taken, speed, acceleration and time, for instance. The device even has way to measure altitude. "It's got a pressure reader so it knows if you are on the third floor or first floor of a building," David said. The WINS isn't perfect. As time goes by without a new GPS signal, its estimate of current location will degrade, David said. But the device provides for the user an estimate of its own miscalculation. "After a time, it'll show you a circle radius for the error range," he said. "It's still better than having no GPS at all." "Say we go to Southeast Asia and I'm in the middle of the jungle. There are not a lot of good landmarks. I'm navigating around and I lose the GPS because with the triple-canopy jungle, the GPS can't penetrate that. I don't know where I am on the map, so I'm in a bad situation. If I want to know exactly where I am so I can call for reinforcements or resupply, WINS is going to give me my location on a map, no matter where I am." David said CERDEC is still working on issues like where would be best for a Soldier to wear a device like WINS. He also said that he expects the engineering specifications for WINS to be transferred to Program Executive Office, Intelligence and Electronic Warfare & Sensors by 2017. It will be inside an Army program manager's office, not an Army lab, that WINS or the technology it contains will be made available to Soldiers. David also had with him a device he called the "Soldier Power Manager." The power manager was connected to a "conformal battery," which was also developed at CERDEC in conjunction with industry. The conformal battery is flexible and slips easily into a Soldier's tactical vest without being uncomfortable due to stiffness. It wraps around a Soldier's torso. "It lets you know how much energy is left and what is plugged in," David said. He said one advancement they have made on the system is to transfer the user interface to a Nett Warrior device, so Soldiers can see it on that screen. "It lets you see the total power left on the device and how much energy each device is pulling, so you can make a decision about what device to pull -- when energy gets low -- to make sure you have enough power to meet mission needs. We have sort of integrated the energy component with the information to make better choices in the battlefield in terms of operational energy." The device, he said, is still under development. Though "fairly mature," it is not yet fielded to Solders.